Sat., 1 Jun. - Thu., 10 Oct.
Wed., 30 Oct. - Fri., 8 Nov. Thu., 22 Aug. - Tue., 27 Aug.
Wed., 4 Dec. - Sat., 14 Dec.
Fri., 6 Dec. - Sun., 15 Dec. Thu., 17 Oct. - Fri., 8 Nov. Tue., 27 Aug. - Tue., 10 Sep. Sat., 21 Sep. - Mon., 7 Oct.
Fri., 6 Sep. - Sun., 15 Sep. Thu., 7 Nov. - Mon., 18 Nov. Tue., 10 Sep. - Thu., 24 Oct.
Wed., 9 Oct. - Sat., 19 Oct. Sat., 27 Jul. - Sun., 18 Aug.
See all 167 properties in La Aurora Intl. 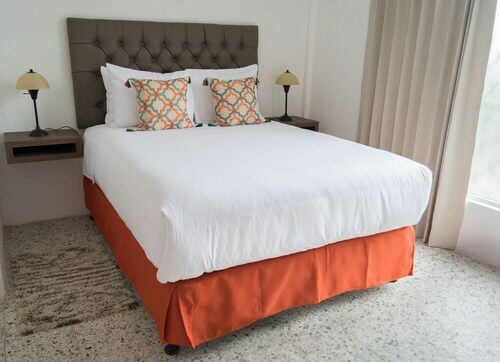 Barceló Guatemala City is situated in the financial district, 15 minutes by taxi from the historic center and just a 7-minute free shuttle ride from La Aurora International Airport. There are plenty of restaurants and shops nearby, and the National Theater is a 10-minute drive away. 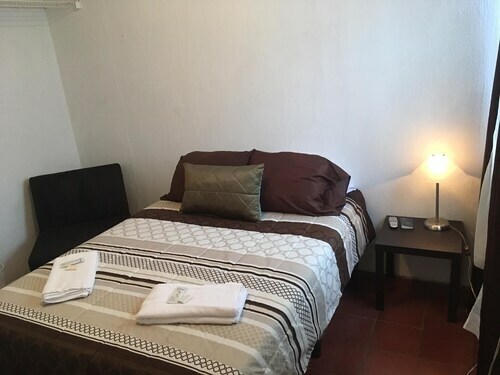 Located in Zona 13, this hotel is within 1 mi (2 km) of Natural History Museum, National Museum of Archaeology and Ethnology, and National Museum of Modern Art. Children's Museum and El Obelisco are also within 2 mi (3 km). 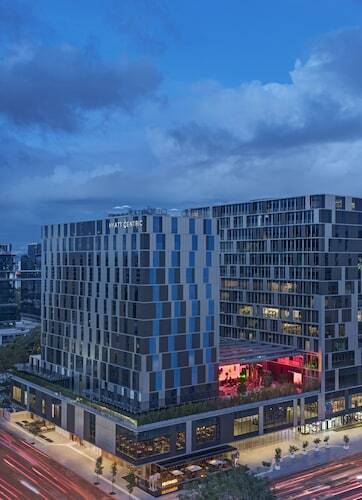 Located in Zona 10, this luxury hotel is within a 5-minute walk of Plaza Fontabella Shopping Center and The Village Shopping Center. Union Church of Guatemala and Embassy of Germany in Guatemala are also within 10 minutes. 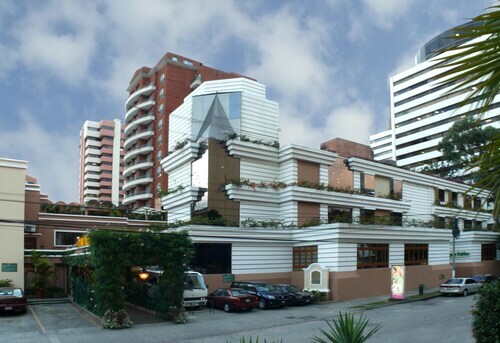 Located in Zona 10, this hotel is within a 5-minute walk of Plaza Fontabella Shopping Center and The Village Shopping Center. Union Church of Guatemala and Embassy of Germany in Guatemala are also within 10 minutes. Located in Zona 9, this hotel is 0.7 mi (1.2 km) from Oakland Mall and within 3 mi (5 km) of Natural History Museum and Children's Museum. Teatro Nacional and Central Market are also within 3 mi (5 km). 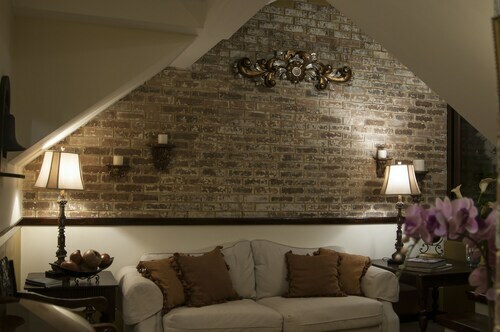 Located in Zona 13, this bed & breakfast is 2.4 mi (3.9 km) from Plaza Fontabella Shopping Center and 2.7 mi (4.4 km) from Oakland Mall. Mundo Petapa and Catedral Metropolitana are also within 6 mi (10 km). 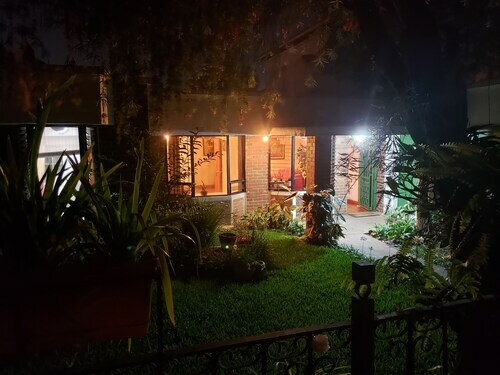 Located in Zona 13, this bed & breakfast is within 3 mi (5 km) of El Obelisco, Plaza Fontabella Shopping Center, and U.S. Embassy in Guatemala. Oakland Mall and Torre del Reformador are also within 3 mi (5 km). Question : How much time do people spend in Guatemala City? Answer : The average time spent in Guatemala City by passengers from Toronto is 16 days. However long you decide to stay, give yourself plenty of time to see what makes Guatemala City fantastic. Question : What is the cheapest airline flying from Toronto to Guatemala City? Answer : Aeromexico strives to keep costs low for their passengers over the next three months. Fares are being booked at just $407, which is quite a deal when compared to the high-end bookings of $1,313. Question : How much is a plane ticket to Guatemala City (GUA) from Toronto (YYZ)? They can range from $407 to $1,313. Booking in advance can normally help you get the cheapest ticket. Don't forget, booking ahead can save you dollars can use to treat yourself while on your holiday. And who doesn't enjoy treating themselves? Answer : They can range from $407 to $1,313. Booking in advance can normally help you get the cheapest ticket. Don't forget, booking ahead can save you dollars can use to treat yourself while on your holiday. And who doesn't enjoy treating themselves? Answer : The cheapest day to fly from Toronto to Guatemala City is on Tuesday. If you would like to save a little cash on your next trip look for flights on that day. Question : What is the cheapest date to fly to Guatemala City? Answer : If you are wanting to save some moolah, look at May 10th. As of Apr 15th, it's showing the cheapest ticket sales at $414. That is 25% below the average price for this route, so you can spend that extra dollars on some souvenirs while in Guatemala City.